As a leader in IT Development, you know first-hand the importance that quality assurance (QA) and testing plays in the overall software development process. QA teams test critical functionality to ensure your software or web app are working as planned. Quality Assurance is critical for delivering on business objectives and providing seamless functionality to the end user. The problem is, the quality assurance process is arduous and expensive. Enter artificial intelligence (AI). With the rapid adoption of AI, we’re able to automate the quality assurance process and reduce human testing hours by 80-90%. Automating the QA process will be a game-changer for your organization, but how do you demonstrate the impact to IT executives? It’s simple. Show IT leaders the enormous return on investment they’ll receive from automating this process. 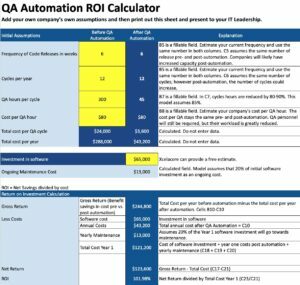 Get our FREE ROI Calculator that will show you how automating the QA testing process will deliver meaningful results – usually in the first year! Fill out the form to the right and you’ll gain immediate access to the ROI calculator for automating quality assurance in your organization.